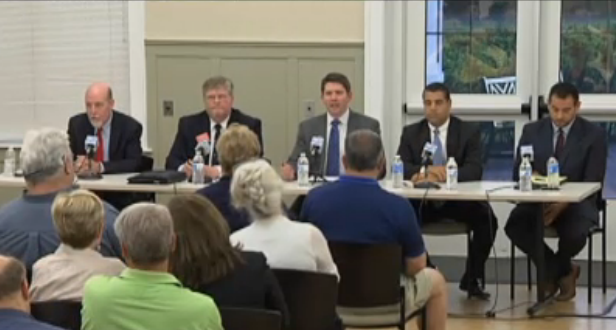 The candidates at a forum in Glastonbury. From left, Joe Markley, Ronald Eleveld, moderator John Tanski, John Pavia and J.R. Romano. Seventy-four Republicans are eligible to cast votes for one of four declared candidates who promise to re-energize, reorganize and re-brand a party that holds no statewide or federal offices and is barely clinging to a 20-percent share of registered voters. 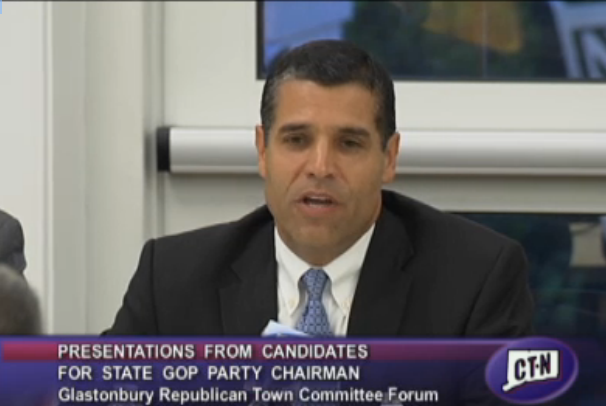 “You’ve got a distressed company on your hands,” John Pavia, one of the candidates, told Republicans at an open forum in Glastonbury earlier this month. He is a former GOP finance chairman — and an equity investor who specializes in turnarounds. Pavia, 52, of Easton is competing with: Joe Markley, 58, of Southington, a state senator and political organizer; J.R. Romano, 36, of Derby, a former GOP political director and campaign manager; and a late entry, Ronald C. Eleveld, 55, the chairman of the Republican Town Committee in Windsor. Jerry Labriola Jr., who is closing out four years as chairman, has injected a small note of uncertainty in the contest. He is not publicly seeking another term, but he has dodged questions about whether he would offer himself as a compromise if the Republican State Central Committee deadlocks. 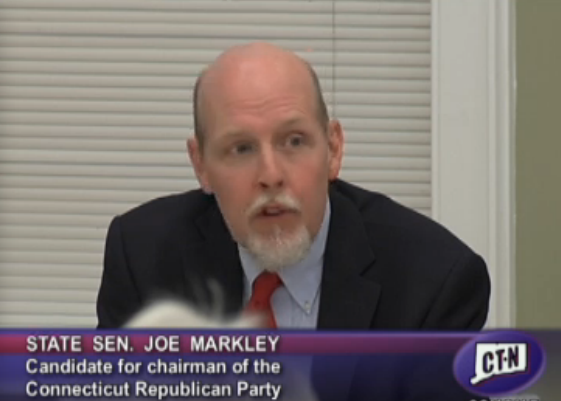 The focus has been on Markley, Pavia and Romano, each of whom gives a similar assessment of the race: No one has a significant lead in commitments from 72 members of the state central committee. The heads of the Young Republicans and College Republicans also can vote. The election is only the fourth contested race for GOP chairman since the 1980s. From 1995 until 2011, when Republicans John G. Rowland and M. Jodi Rell were governor, the committee typically deferred to their choices for chair. One of the duties of every new chairman is to define a role that has evolved over the decades as political power and resources have splintered. The job carries little direct authority, yet requires the ability to wrangle candidates, donors and activists behind a common vision. Chris Healy, who was Labriola’s predecessor and now is a senior adviser to Senate Republican Leader Len Fasano of North Haven, said Labriola, like every chairman, will find leaving the post to be a relief. One of many challenges for the next chair is how to address the fading of both parties as political brands. In Connecticut, the biggest bloc of voters approaching election day last fall was unaffiliated at 41.7 percent of the electorate, followed by Democrats at 36.4 percent and Republicans at 20.8 percent. Hovering at 20 percent is unsettling to some GOP activists. 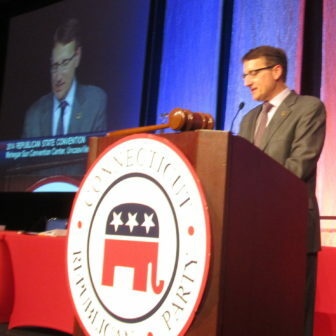 A party is defined as a major party in Connecticut, a status that provides automatic ballot access for all its nominees, by meeting one of two thresholds: Its candidate for governor must have won at least 20 percent of the vote in the previous election, or its party membership must be equal to at least 20 percent of the voters of all political parties. Not counting unaffiliated, GOP voters are more than 35 percent of the total. Catherine Marx, who competed with Labriola four years ago, warns that the party is at a crossroads, despite being competitive in a growing number of General Assembly races and winning a majority of municipal elections in 2013, albeit in small and mid-sized communities. It cannot hope to compete statewide without increasing the number of registered Republicans, requiring aggressive outreach, she said. “People are going to have to get out of their comfort zone,” she said. For the party out of power, the state chairman often plays a role in messaging, as well as financing and staffing a political infrastructure. But the days of the chair as political boss ended on April 10, 1975, with the death of John M. Bailey, the Democratic state chairman for 29 years. Bailey influenced and, at times, dictated which bills passed in the General Assembly, and he brokered the makeup of the Democratic tickets for office. In an age when candidates can run with public financing and seek nominations through direct primaries, state chairs now have little influence over their party tickets. In the two years before the 2014 elections, Gov. Dannel P. Malloy helped Democrats raise $5.3 million for its major fundraising account. Over the same period, the GOP raised $1.2 million for its equivalent fund, a mark that Labriola calls respectable for the party out of power. The Democrats’ superior get-out-the-vote effort, which included identifying and turning out voters who usually come out only for presidential elections, helped Malloy overcome dismal polling numbers to win re-election. “At this point, messaging is important, but what’s more important is to raise the appropriate dollars to fund a political operation and create an infrastructure that can win elections,” Boughton said. The GOP’s present finances are not readily transparent. It ceased filing monthly reports with the Federal Election Commission in this municipal election year, which is allowed when the party is not engaging in “federal election activity.” It will be filing two six-month reports to the FEC, with the first due in July. 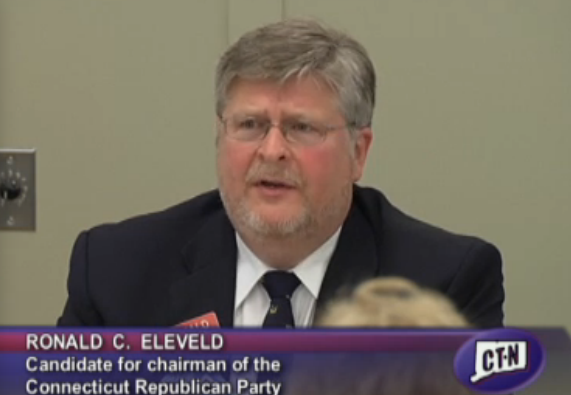 The GOP must file quarterly reports with the State Elections Enforcement Commission detailing its smaller state account. Through March 31, it reported raising $20,540, nearly all from two donors: $10,000 each from McMahon and her husband, Vince McMahon, the head of World Wrestling Entertainment. Connecticut is seen as an ATM for presidential candidates, but the wealthy of Fairfield County are not nearly as generous to the state party. 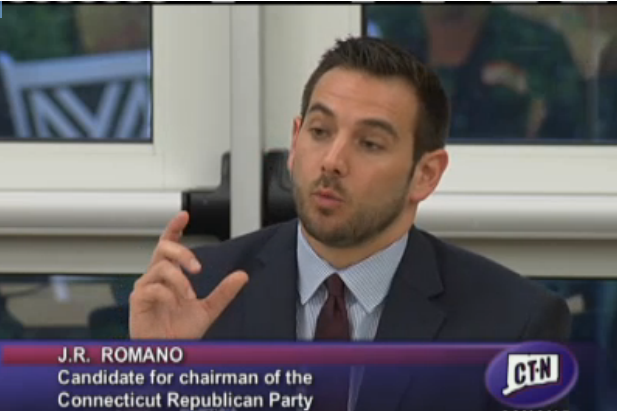 Pavia, Romano and Markley all say the party has to convince donors the state GOP is a good investment. In April, Pavia began circulating “Project Renewal,” a six-page outline of a strategic plan for a new GOP. Markley and Romano, have produced their own versions. GOP state Chairman Jerry Labriola Jr. opens the 2014 convention. Labriola has avoided the press in recent weeks, but in a text message he defended his record and praised his would-be successors, while seeming open to the unlikely chance he would be drafted for re-election. He says he already is looking forward to helping Marco Rubio win the GOP nomination for president. Labriola said his would-be successors are “four capable guys,” but he responded indirectly to their criticisms and their assessments of the Republican Party as needing an overhaul. Connecticut is a solid blue state in presidential elections, and the last Republican to win a congressional race was Chris Shays in 2006. But the GOP came within 6,500 votes in 2010 and 30,000 votes in 2014 of winning the race for governor. Republicans also have rebounded in the state House of Representatives. After winning just 37 seats in 2008, when Barack Obama topped the Democratic ticket, Republicans captured 64 seats last year, a 20-year high that was 12 votes short of a majority. With 15 of 36 seats, they are four seats short of a majority in the upper chamber. A continuing state budget crisis, replete with corporations threatening to leave the state over its business climate, also heartens Republicans. They say the controversy has drawn unprecedented public attention to the General Assembly and the Democrats’ fiscal stewardship. Labriola has used the controversy to set a $500,000 fundraising goal to help Republicans continue their gains in the General Assembly. It most likely will fall to others to carry out the plan. Correction: As originally posted, the story incorrectly reported that a party must have 20 percent of the total voter rolls to be a major party. It must have 20 percent of the total number of voters enrolled in parties.